You cannot use Outlook Express until you have configured at least one email account. When you open Outlook express for the first time a wizard guides you through the new account setup process. However new email accounts can be setup at any time. Outlook express allows you to setup multiple email accounts. Each email account will correspond to a mailbox. Before proceeding with the setup you need to obtain your account details from your email provider. POP3 server-This server is used to receive email. 2. The Internet connection wizard page will appear. Enter your display name in the box. The display name can be anything you want and will appear in the from filed on your outgoing messages. 3. Click next. A page will appear prompting for your email address. This is the reply address for all the emails that you send. 4. Click next. A page will appear prompting you for your email server names. The first box is a drop down box where you select the connection protocol.This was normally POP3 but can also be IMAP4 or http ( if connecting to hotmail). Enter the server names given by you email provider. 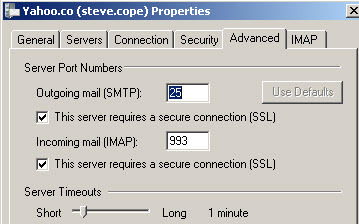 In the example screenshot below both SMTP and POP3 sever names are the same this isn’t always the case. 5. Click next. A page will appear prompting for your account names and password. Enter the details as provided by your email provider, and ensure the remember password box is ticked or you will have to type it manually each time you try to receive emails. 6. Click next and then finish to finish the setup. The new account is created and appears in the list along with any other pre-configured accounts. 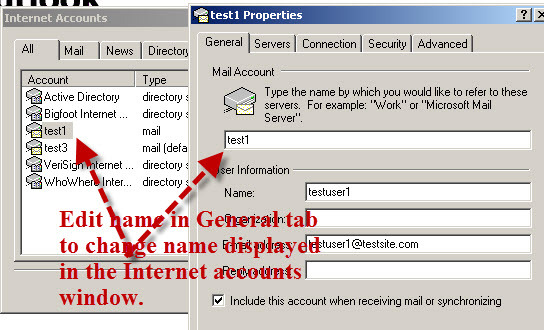 The name of the account is the POP3/Imap4 server name that you entered. The account can be edited by highlighting it and then clicking the properties button on the right. The email setup Wizard doesn’t allow you to configure important security settings that are required by modern email service providers so you will normally need to edit the account once it has been created. 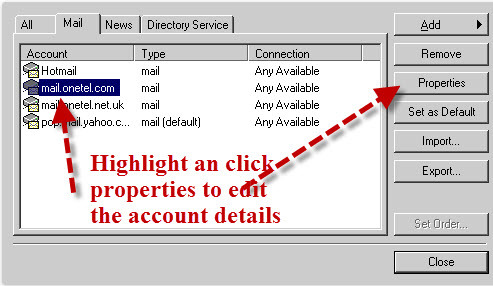 Highlight the account and click properties. Under the server tab you will need to tick the box for my server requires authentication. Under the advanced tab you can configure the Ports that pop3/Imap and SMTP use. They generally only use different ports when used in conjunction with SSL security. Older configurations didn’t use SSL security but almost all email providers do require it. Here are the settings for Yahoo Mail using IMAP. 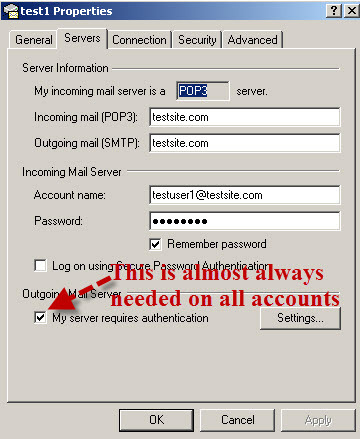 Also under the advanced tab for POP3 accounts you will see an option to leave email on the server. 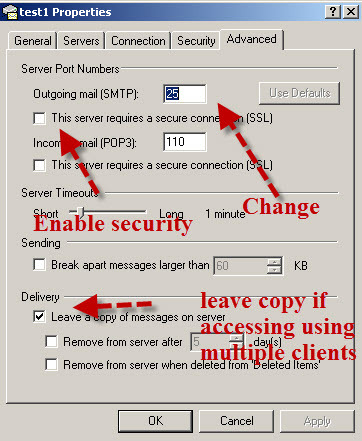 This is an important setting when accessing a mailbox using POP3 with Multiple email clients. The outlook express new account wizard was designed for setting up new accounts at a time when security was not a concern. Email accounts from most email providers require various levels of security and you will find that you will need to edit the email account settings of the accounts that the wizard creates. Most of the emails I get regarding Outlook Express problems are account setup related so take care with the setup, and if you do experience problems double check your account settings. Here is a short video that that takes you through the setup process.